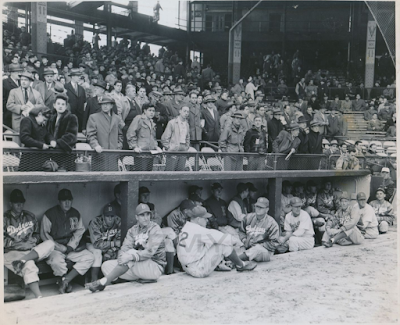 Here's a great look at the Brooklyn Dodgers dugout at Ebbets Field just prior to a game. The undated photo, likely from the 1940's, recently sold at RMY Auctions at a very reasonable $45 (auction link). This Day in Dodgers History: In 2016 the Dodgers signed free agent minor league reliever Fabio Castillo. He made his Major League debut with the team last season -- pitching in two games, allowing two earned runs, three hits and a walk while striking out two in 1.1 innings. Castillo had been designated for assignment and is currently a free agent. Happy Birthday, Bruce Brubaker, Rod Nichols, Hank DeBerry & Devon White! Awesome! Via Nick Diunte at Baseball Happenings; "Jackie Robinson's lone day as shortstop for the Brooklyn Dodgers." Per Elijah Chiland at LA Curbed; "Dodgers star Kenley Jansen tosses out $6.5M for mansion in Palos Verdes Estates." It was only a matter of time that sexual assault allegations would start to make their rounds in Baseball. Frankly, if there is any place where this kind of abuse happens regularly it is in sports, so you should expect a whirlwind to quickly take shape. Would it be fair to say that we all know there is hell to pay? Per Jeff Passan at Yahoo Sports; "Miguel Sano accuser will talk with MLB as #MeToo movement hits baseball." 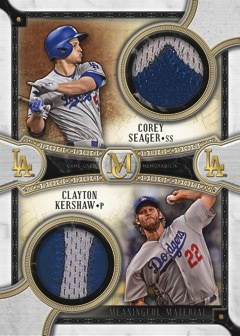 Blowout Buzz shares a bunch of preview pics from 2018 Topps Museum Collection, slated to be released on June 20th next year. 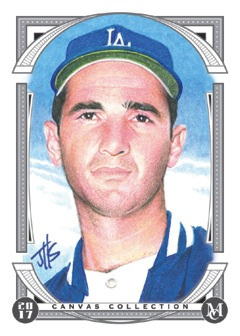 Check out the below Sandy Koufax, Corey Seager and Clayton Kershaw cards below. Go here to check out more pics. And those last few minutes … if I could bottle that feeling I would. I remember looking around at the Staples Center crowd and seeing people with tears in their eyes. It’s hard for me to put into words, even now, what that meant to me. I’ll never forget those few minutes. It felt like the entire city of L.A. was packed into Staples and it was perfect. When I lifted the Cup, I just felt weightless. But I remember feeling proud more than anything else. Proud of our group, which had been together for so long, proud of our organization for building up to a run like this, and proud of the city for coming together like it did. At the parade a few days later I met an elderly fan. He told me he had been waiting since 1967 for us to win a Stanley Cup. And as we traveled down Figueroa Street, I kept meeting more and more people like him. Fans who had been there for everything: The start of the club, the Triple Crown era, the Gretzky years, the Cup finals loss, the dark periods and everything in between. They stayed loyal after all those seasons, and it was a tremendous honor to be a part of the team that brought them a Cup.